Log An ancient creature made of rock. Its Defense is high. You can't jump on it because of its spikes, and you can't get close to it because of its spears. That's a Dark Bristle. It's an ancient creature made of rock. Max HP is 8, Attack is 8, and Defense is 4. You can't jump on it because of its spikes, and you can't approach due to its spears. AND its Defense is high. You'd better take it out with special attacks or items. 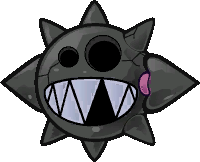 The Dark Bristle is a more powerful version of the Bristle fought in Paper Mario: The Thousand-Year Door. Dark Bristles are only found in the Pit of 100 Trials, on levels 81-89. The Quake Hammer badge, POW Blocks, and Earth Quakes will flip them over for two turns, dropping their Defense to 0. If Mario is wearing the Spike Shield badge, they will not extend their spears to poke him if he readies his hammer. Being stomped with Spike Shield also works, however, unlike Koopa Troopas, this will not flip them over. If Mario uses Super or Ultra Hammer to land the first strike outside of battle, their spikes will not extend either. This page was last edited on June 9, 2018, at 10:32.